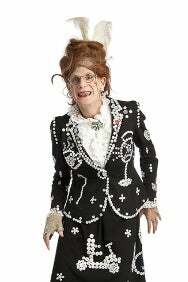 Ida Barr  the people’s pensioner and the Queen Mother of our hearts  is a former music hall singer turned rap star and Underbelly favourite. Her brand of Artificial Hip Hop has thrilled listeners globally from dope cribs to residential care homes. Now the hip-op hip-hop star, the missing link between music hall and dancehall, presents her Revolutionary Bingo Show. Change the world and win big! Nothing will be the same again after a night of social agitation and tiny acts of rebellion using protest R&B and dissident songs from the 19th Century all rapped up in a communal hip hop style with mass singalongs and lots of that most revolutionary tool of all  laughter!